When I was fifteen, I found myself in my parents basement, mouth-agape at the television screen as I witnessed my very first Miyazaki Movie. It was called Spirited Away, and I have yet to find a movie so aptly named since. The animation was smooth and classic-looking. Bright colors, vividly memorable and lovable characters. I laughed, I cried–I was in love. Turning to my friend Ally at the time, I saw the same awe and wonder in her face as I felt must have been on mine. Ever since that night, when I took a risk at Blockbuster in renting Spirited Away, I have been absolutely enamored with any Miyazaki movie I have had the chance to watch. Even now, in my small collection of DVDs I have collected titles like Kiki’s Delivery Service, My Neighbor Totoro, Howl’s Moving Castle and Castle in the Sky. Along with lesser known titles like Whispers of the Heart and my most beloved, Spirited Away, I have absorbed each one and cherished it for all that it was worth. Each movie I had seen held a certain wonder for me that I can only compare to opening the cover of a new fiction novel and delving into the rich imagery only otherwise found in your imagination. Naturally, when I caught wind of Hayao Miyazaki’s Studio Ghibli’s new movie, The Secret World of Arrietty–I knew I had to see it. Dutifully, my boyfriend obliged me, and together this past weekend we held our breath in the dim of the theaters and prepared to be wowed. Approximately four minutes into the movie, I felt my boyfriend’s head nodding against my shoulder. He had fallen asleep. And, to my great despair: I found I couldn’t blame him.How had this all gone so wrong? And is it wrong to blame Disney? The Secret World of Arrietty is a story based on the children’s book, The Borrowers by Mary Norton. It’s a whimsical sort of fiction novel about the lives of tiny people who refer to themselves simply as “Borrowers”, due to the way in which they survive: Living by “Borrowing” from human “beans”. Little things like, a cube of sugar, could last a borrower months due to their size and humans wouldn’t even notice they’re missing. The key to this plot? Borrowers cannot be seen by the human “Beans” or else they have to move. Why? Because once a human “bean” is curious, it can’t be stopped. This plot should be familiar enough to anyone in my generation. Recognize this movie poster? Well you should. It came out in the 90’s and seemed to plague my childhood for years. 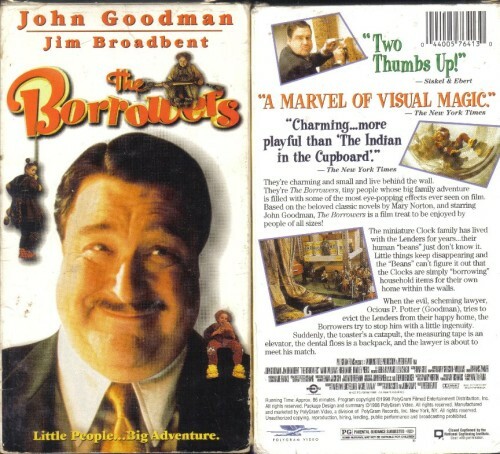 Every time I turned on the television, John Goodman’s mustachioed face would be peering back at me as he searched for “the little people” who lived under the floor boards of his house. But, I had hoped, due to my high esteem for Miyazaki, that he would save this film-failure with his beautiful animation and charming characters. I was very disappointed to find it otherwise. In fact, the only thing that even really resembled what I love most about Studio Ghibli films was the animation style. The film itself had an anti-climatic plot. Arrietty is spotted by the sickly human “bean” Shawn, who then attempts to befriend her. Really, all he does is eventually lead the crazy housekeeper, Hana, to their hiding place and force Arrietty and her parents to leave the house. Then, he proceeds to talk about death with a smile on his face. It was so grim that I recall looking around the theater to see if there were any actual children in our showing, curious as to how traumatic Shawn’s bizarre monologue had been on them. Usually, humor is littered strategically throughout Miyazaki movies, but the only laughs I continually found in this film were due to the frantic antics of the crazy housekeeper, Hana. In fact, I think between Hana and Arrietty;s mother, they were the only interesting characters for me throughout the whole film. Hana is odd, with her constant mumblings to herself and her obsession with proving that the “little people” exist. She also has an epic battle with a crow and a slipper that I couldn’t help but enjoy. While Arrietty’s mother is a train wreck of a person. She’s constantly worried that her husband and daughter are going to be caught while Borrowing, and makes laughable little quips throughout the movie that made me glad she was there. Arrietty’s character is pretty bland as far as heroines go. I had a hard time finding anything relate-able or admirable about her, and more often found myself annoyed that she was so predictable. Her character is pretty much the standard rebellious youth who doesn’t do exactly what her parents say and ultimately gets herself and others into unpleasant situations. Like getting her mother trapped in a jar, for instance. There didn’t even seem to be any development for her for the entire film. She essentially was who she was from the get go. The other odd thing about this Miyazaki film, that I hadn’t much thought about until my boyfriend pointed it out, was the lack of driving music. Usually, Ghibli films are scored with beautiful music that drives your emotions accordingly. Joe Hisaishi, is the one who usually works on these sorts of films; filling the film with laughter or sorrow depending on a note change. Usually, these melodies are upbeat and memorable–as they should be. Music is a driving force behind a film, even if you don’t realize it. It helps direct the audience’s emotion in a film. With The Secret World of Arrietty, there only seemed to be a few moments of music, punctuated by long eerie silences. These silences were often filled with creepy house sounds in stereo. I suppose this was to help the audience feel smaller and more borrower-sized, but it was a poor choice. Ultimately, I don’t recommend you waste your money on seeing this in theaters. In fact, if you don’t mind subtitles, there are definitely anime websites online that you can watch this movie on for free.